People looking for the Phi Phi party scene won't be disappointed. Phi Phi rocks all year! Even though Koh Phi Phi is a small island it has the magic to bring people together so that there is always a busy bar, a happening place and a night that goes off with a bang. Phi Phi party scene mainly hangs off the traveller, backpacker scene and those who travel to Thailand just whoop it up. Island life is free and easy, the dress sense 'whatever' and so with this backdrop it's easy to understand why all the ingredients are in place to have some fun. On top of this the whole world converges on Phi Phi so you are as likely to meet a Brazilian volleyball expert, a Reggae master or a group Swedish divers, it really has a one world kaleidoscopic buzz. No Phi Phi party is quite complete without the beach and though many start their nights in places like the Dojo Bar or the Reggae Bar most people decant to the Carlitos Bar or the Slinky Beach Bar. The early evening scene picks up after people finish their meals in the centre of town and the obvious places to check out are the Dojo and Reggae Bar which are picking up the pace with the latest tunes, and in the Reggae with a bizarre Thai Boxing show. 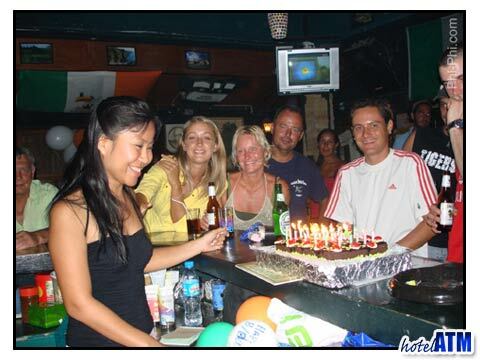 Also the Divers Bar above Phi Phi Scuba Dive Centre is a popular place to hang out. The main Phi Phi party beaches are Loh Dalum home to Slinky Beach Bar, Apache, Hippies Beach Bar and The Stones Bar and on the south beach overlooking the cliffs and the main pier there is Carlito's Bar and the Apache Club. These bars often have a fire show around 9-11pm and build the music till dancing kicks off and the fun goes on all night. the main Phi Phi party tool is 'Bucket'. These converted ice buckets are filled with a quarter bottles of spirits, ice and sodas and are drank though straws. There are infinite variations of these buckets that turn out to be large cocktails. Bucket packs can be bought from all over the island and are highly popular. The other key tool is the Phi Phi party flier. Each night there are people giving fliers out telling you what's happening and where. You can find these fliers near the The Dojo / Reggae Bar area and down at the pier when you arrive off the ferries. The Phi Phi party Crew are something relatively new to the island as they party at sea. Organized from a group of bars like the Dojo, they meet and take a boat out to Phi Phi Ley or wherever the weather is just right and party swim, dance, kayak for a few hours around sunset before returning to the island to continue well into the night. More details here on the Phi Phi Party Crew.